Today is the last day to book Hyatt Gold Passport reward nights at the old rates! The new, more expensive chart comes into effect tomorrow. If you have any planned Hyatt stays coming up where you wanted to redeem Gold Passport points for then you should do it by 11:59EST tonight! Air Canada is running a contest where you can win 125,000 Aeroplan Miles when you participate in their Carbon Offset program on Air Canada flight until Feb 28. Full details. Thanks to long time Rewards Canada subscriber Andrew S. for alerting us to another new hotel reward program. 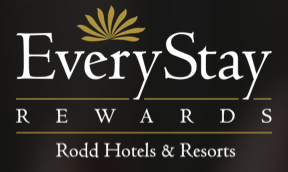 EveryStay Rewards is the frequent guest program for Rodd Hotels & Resorts in the Maritimes. You can be sure this program is now on our radar and will keep you up to date with any news and promotions from them!. Find out more about EveryStay here. In the bonus offer section you'll find lots of bonuses and one of note is the travel twice and get one free for Amtrak's Cascade service. This is Amtrak's service to Vancouver so if you are in the lower B.C. mainland and use Amtrak be sure to register for this offer! EVA Air has a great deal on flights between Toronto and Manila, only $2,042 all in for premium economy or $1,230 in economy. The fare must be booked by Feb 2 for travel Feb 2 - May 31. Full details can be found here.